This Weekend Wonder is dedicated to Cardamom and Deception. Sweet. Deeply aromatic. Mentholated. Cooling spice. Beguiling. Exotic. Heady scents. Complex, Intensely aromatic, sweet, complex, spicy, beguiling, heady. Intoxicating. Complex, of citrus, peppers, flora and herbs. Bringing intrigue. Delivering depth. Resinous. Deception. That feeling of being let down. Lied to. Treated with malicious intent. See, I am partial to Le Paris, in a way that forces me to give the city credit in spite of certain ‘not-up-to-measured-standard’ incidents, like the worst meal ever. Or the deception that lies in white cardamom pods. Which are essentially bleached green pods. 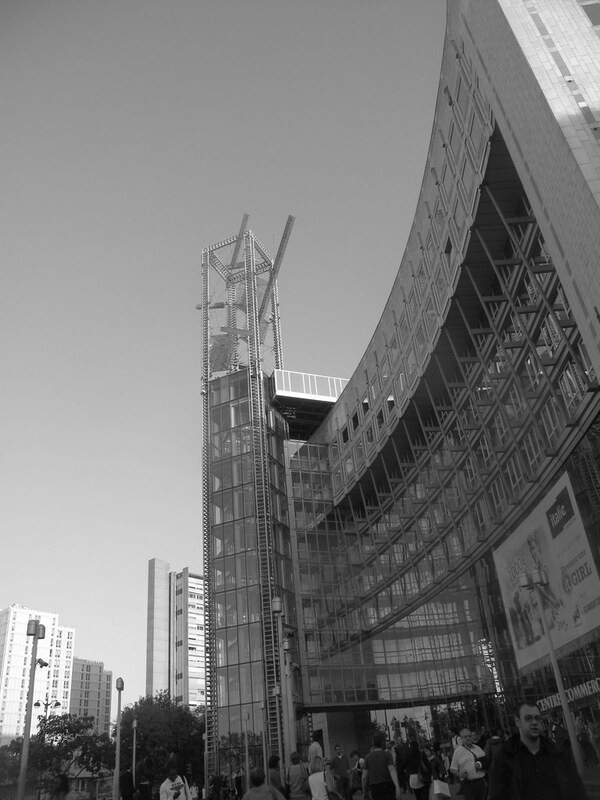 Not that it was apparent that Friday evening as I flitted up and down the aisles of Carrefour on the Avenue D’Italie. Apparently considered an aphrodisiac, cardamom has properties that cool the body when it’s hot and warms it when it’s cold. 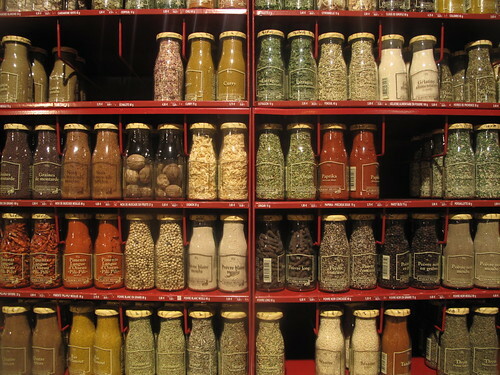 There are rows and rows of spices in bottles. I’m intrigued. I begin to practice my translation skills and spice recognition. The ones I don’t recognise like Colombo and white cardamoms I gently pick up – and plonk in my basket. I also take a bottle of Piment d’Espelette, which I already had on my list. I recognise the long pepper, paprika and nutmeg. I never knew cardamom pods came in more than green or brown. I snap a bottle up in a flash, excited. Alive. Herbs and spices have that effect on me. I sit all weekend thinking of my great discovery. Of what I’m going to do with it. What I’ll make and bake. How amazed ‘everyone’ would be. Everyone indeed. And then I’m home and off to the web. The investigation commences and the trickery is revealed. The grand plan to ‘trip’ me up is exposed. 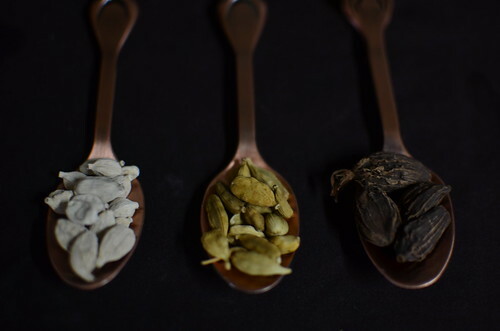 ‘What I wanted to know was if it was more like true cardamom (the green pods) than the equally pungent but less attractive black variety. Well it is more like the former, very much more like the former because according to Madhur Jaffrey’s excellent ‘Ultimate Curry Bible’ it is nothing more than bleached green cardamom! Doh!! It seems that the pods are blanched for ease of use in sweet preparations when the natural colour of the sauce or ice cream wants to be maintained…. Shock. Horror. Anger even. And back to store cupboard the bottle went. Shoved into the very back. Into darkness, black and dreary and oh so scary. Fit punishment. Unlike my gin peppers. Cardamom is the third most expensive spice in the world after saffron and vanilla. And Nigeria, yes my Naija is one of the top exporters of cardamom. Saying that, I’ve NEVER looked for, and never seen cardamom in market stalls. Now I’ll pay more attention. It features prominently in Indian, Middle Eastern, North African, and Scandinavian cooking. Native to Indian, where it grows wild in the evergreen, monsoon South Indian forests of the Western Ghats. Its cultivation has spread to countries around the world from Sri Lanka to Indo-China,Vietnam, Laos and Cambodia. Tanzania, El Salvador and and Guatemala. Popular in Indian cuisine, Cardamom is used in curries, rice dishes, drinks and desserts. As well as in Ayuverdic medicine, for its healing potential in teeth and gum infections and in curing digestive disorders. It is used in the Turkish coffee, where the coffee beans are ground with whole pods. Deliciouso. I know, for it is one of my favourite ways ever to have coffee. These days I crush pods with my teeth, cracking shell and seeds. I spit gingerly remove it from my mouth, and set it my mug. With instant coffee, hot water, dash of milk and some Agave nectar. I’m set. To sit on the couch in the cool, early morning. And reflect on my life. In the Scandinavian kitchen, Cardamom has pride of place, featuring in both sweet and savoury delights. Delicious breads like boller and the Icelandic pönnukaka are only a few, as well as cakes and pastries. Along with grains of paradise, it is used to flavor Aquavit, pickled herring and meatballs! The countries in the western Asian region like Saudi Arabia, United Arab Emirates, India etc have maximum consumption and these countries share around 60% of the world’s consumption. The Scandinavian countries like Denmark, Finland, Sweden, Norway and Iceland have around 16% share in the world consumption. 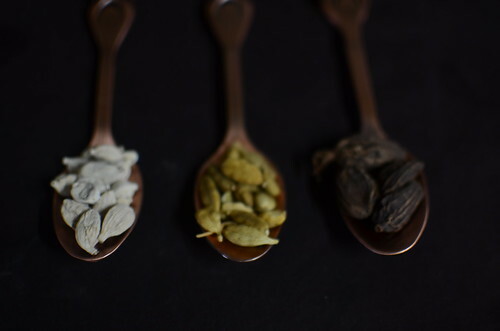 Cardamom has been used in a variety of ways – both historically and to this day. Take Cartier’s Declaration, a perfume that combines smoky cumin and the spicy warmth of cardamom. An apparent favourite of some. In ancient times, Egyptians chewed on the pods to keep their teeth white and bright, the Romans used it as digestives after lavish feasts and the Scandinavians fell in love with it, thanks to the Vikings who discovered it in Constantinople. Awed, the Nordic explorers brought it back home to the Nordic countries where it remains popular to this day. White cardamom is essentially bleached green cardamom. Its scent, as a result of the bleaching is muted, and is a mere whisper of the original. The pod tends to be softer as a result, and when opened up, the seeds are lighter coloured. It is said that the bleaching dulls the menthol flavours, and bring the sweetness to the fore. We will see. If I can be bothered! 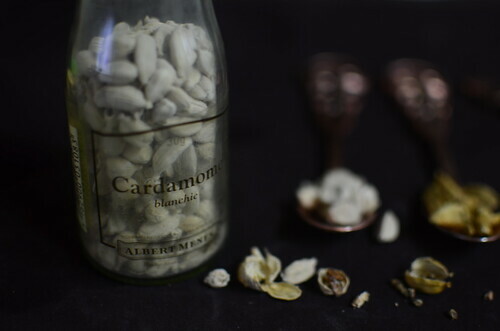 There’s also something called white cardamom. I won’t go into much detail about that, but it’s essentially bleached green cardamom. The bleaching process dulls the peppery and menthol qualities and let’s the sweetness come to the front. White cardamom is more common in Scandinavian cooking. My nose is turned up when I read The Spice House’s commentary on how white cardamoms got their colour. Maybe it is true. Maybe it began in an unplanned manner. Maybe I’ll believe that these sun-kissed and whitened pods weren’t bleached, just because but rather, came unavoidably. Maybe I’ll use them. Sometime. Green cardamom is everything white cardamom is an more. Housed in a bright, green pod thats harder than that of the white, with seeds richer and deeper in hue, and with a mentholated fragrance so intriguing, this is my Queen of Spices. This is what ancients smelled centuries ago before they named her so. The flavour is powerful and mentholated. Take a sniff and watch it go right up your nose. Floral, vibrant, balanced. This is my go-to for sweet and savoury recipes. 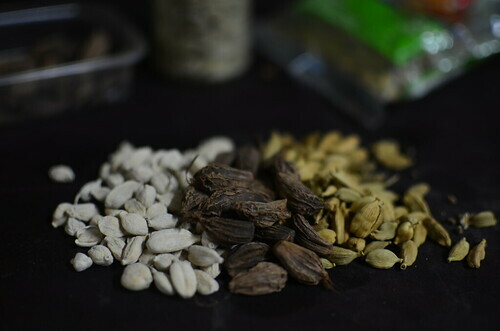 Often, in savoury applications, I use both the green and black/brown cardamoms which are a whole different story. Read on. Please. Its smoky flavor and aroma derive from traditional methods of drying over open flames. Like Enge – Ethiopian pepper used in Nigerian Peppersoup. 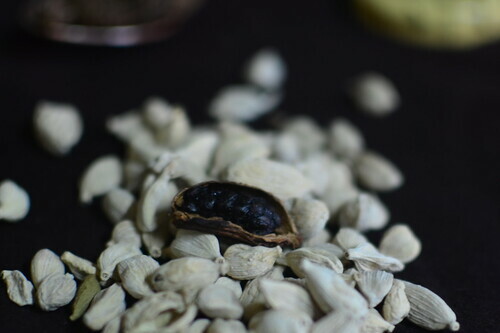 The seeds inside the thick, lined pod are black, shiny and sticky. With a distinct aroma of ‘smoke’. Welcoming, warming, embracing! Max Falkowitz on SeriousEats: A member of the ginger family, black cardamom is a relative of green cardamom, but they’re far from the same plant. It has some of the same flavor notes, especially an uplifting menthol element, but it’s also smoky, brash and bold. There are times for green cardamom’s delicacy, and then there are times to turn things up to 11. Although they have similar flavors, they have very different culinary uses. Black cardamom is the bacon of spices. You can buy cardamom in pods. seeds. or ground into powder. The very best way and guarantee of flavour is buying them in pods. Buy them in the pods. Which protect the seeds and their delicate, entrancing flavour. Keep them in the pods till you need to use them. Then crush the pod to open up and extract the seeds which you can grind in a mortar and pestle. Do you best possible to stay away from ground cardamom. And White cardamom :-)! 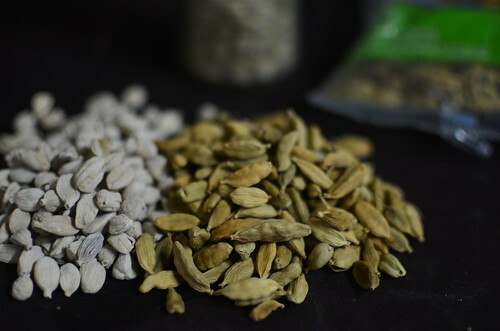 You can get the seeds, known as decorticated cardamom, but they lose flavour quickly. 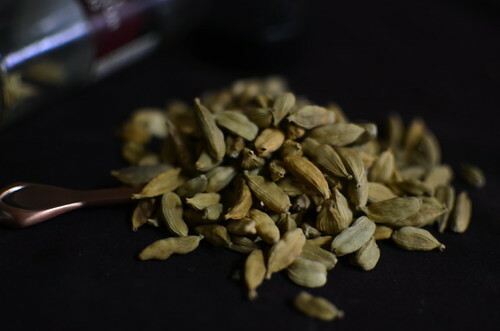 Ground cardamom, easy as it is to use…is not the most flavourful. If it is all you have, sure use it (I have in the past) but nothing compares with grinding your own. If a recipe calls for ground cardamom, here are approximate measures to use. 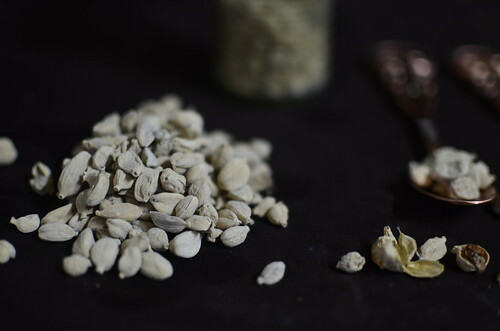 The seeds for 10 pods roughly equate to 1 ½ teaspoons of ground cardamom. Cardamom can be used whole, with the pods cracked or ground – seeds extracted and worked in a mortar and pestle, or spice grinder. The whole pods are great, cracked to expose some of the seeds, then put into rice or curries. To create cardamom powder, you essential crack open the pods, with a pestle, rolling pin. bottle. Then pick out the aromatic seeds from the papery skin. Discard the green skins. Grind the seeds to your liking in a mortar and pestle and use! So there you have it, my Weekend Wonders of Cardamom. Deceived I may have been but no longer. Its time to embrace the heady, minty, mentholated, seductive scents of The Queen.